Can Cancer men and Libra women have a successful relationship that is compatible mentally, emotionally and sexually? The Libra Woman can easily attract any of the Zodiac signs. The Cancer Man will be fascinated by her charm and beautiful ways, but he won’t be able to keep up with her wants. She might be sensitive like the him, but there is very little potential for marriage. 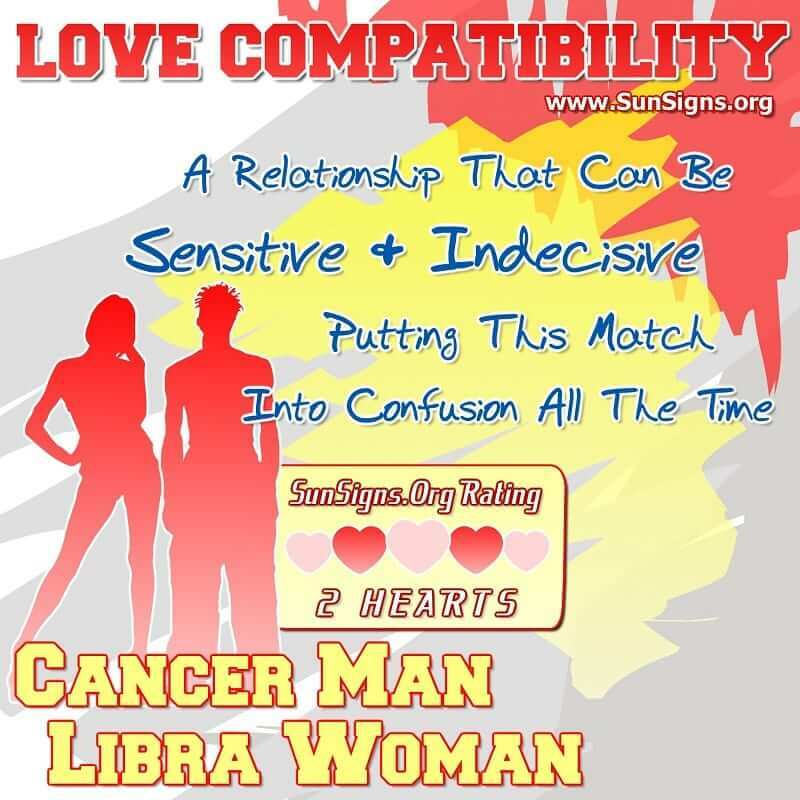 The Cancer man Libra woman relationship might not last for long if there is no love compatibility between the couple. Read on to know more about the Cancer man and Libra woman zodiac compatibility. There is many aspects of the Libra Woman that would appeal to the more emotional side of the Cancer Man. She is not only beautiful, but well-mannered and has a sophisticated way of thinking. The Libra Woman will always try to avoid conflict and thus will solve something before it becomes a problem. If she sees her Cancer Man is upset, she will try to fix the situation before he has time to fester on his emotions, which can lead to an outburst. The Libra Woman is attracted to beautiful and luxurious things while the Cancer Man rather be spending his time understanding the depths of all things. In the end, these two sun signs will have a very hard time understanding each other, let alone be able to deal with each other’s tendencies. Cancer Man And Libra Woman Love Compatibility. A Relationship That Can Be Sensitive And Indecisive Putting This Match Into Confusion All The Time. The Libra Woman is very independent and won’t enjoy spending time at home as much as her Cancer Man. She will look forward to parties and socializing with friends when all he can think about is when he will get his Libra lover to himself. The Libra female can appear very distant once she starts a project and won’t often notice others around her in till her pursuit is over with. Though she might be able to sense her Cancer mate’s turning emotions, if he does have an outburst. He will lose his temper once his jealous emotions take over, it will scare the Libra Woman away. She tries to avoid fighting and arguing at all costs, even if that means running away forever. The Cancer Man is very good at finances, while the Libra Woman is not. When planning an event, she will only be paying attention to the fun details while the Cancerian will be more concerned with the bill and the left over mess. These Cancer and Libra love match will not see eye to eye on most things because Cancer Men can be very reserved while Libra Women want to sail free like the wind. Even the Libra Woman, who has a kind nature and a particular way of looking at things, might not have the patience for the Cancer Man. He will have trouble spending much time out of his shell and mingling with others. He will do this from time to time, but he will soon be jealous of all the attention that the Libra female is getting. The Cancer guy will have a hard time describing his emotions to the Libra Woman who won’t have the ability to recognize them in the first place. She might be able to deal with his emotional, sensitive side, but if the Cancer Man ever has an outburst, the Libra Woman will flee in terror. The Cancer Man is able to understand on a deeper emotional level, while the Libra Woman is able to think on a more rational level. The both have the potential of overcoming each other’s personality flaws, but there is very little he can do to keep the air of the Libran in his fingers. Cancer is a water sign that is cardinal and Libra is an air sign that is cardinal by nature. The Cancer man Libra woman compatibility gets a TWO Hearts love rating. This is not to say that the Cancer Libra relationship is not completely possible. There is a lot these two star signs will have to understand about each other in order to make it worth both of their time.